Concerns about tax hikes leading to price increases for foreign products are pushing people into panic buys, with some mainland consumers saying Wednesday that they are rapidly buying up goods that might be affected. A mother of a nearly-two-year-old child, surnamed Huang, is one of them. 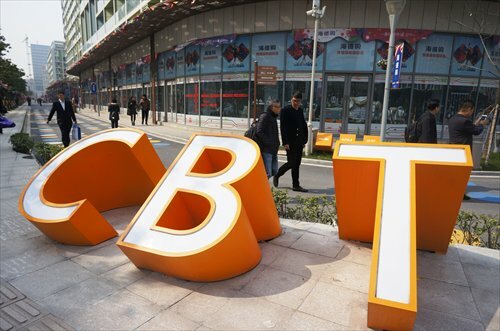 "I learned from the Internet that taxes collected on overseas goods will be increased by 15 percent from the current level from April 8," she told the Global Times Wednesday. "Prices will increase dramatically after that, so I plan to buy as many overseas goods as I can from websites such as Amazon that provide international delivery services," said Huang. Since late February, there have been rumors circulating via the Internet and media reports claiming that new tax policies will be applied to cross-border e-commerce from April 8. In comparison with current policies, one big change is that value-added tax will be imposed and collected at a rate of 11.9 percent, according to a report on February 25 by domestic news portal ycwb.com, which is operated by Guangdong Yangcheng Evening News Digital Media Co.
A member of staff at the General Administration of Customs (GAC) confirmed to the Global Times Wednesday that the authorities are mulling new policies on cross-border e-commerce. But she offered no details of the policies or timetable, adding that the Ministry of Finance (MOF) is in charge of drawing them up. The GAC is just a participant, she said. Calls to the MOF remained unanswered by press time. The new policies will increase costs for cross-border e-commerce retailers, Lu Zhenwang, founder of Shanghai Wanqing Commerce Consulting, told the Global Times Wednesday. "Small-scale cross-border e-commerce retailers and daigou [overseas personal shoppers who buy and send goods to customers in China] can raise prices to cope with increased costs, but this will make them less popular among consumers and they may get squeezed out of the market," said Lu. E-commerce giant Alibaba Group's cross-border marketplace Tmall Global, which offers an online sales channel for various well-known foreign brands, appears to consider the new policies to be good news. The influence on Tmall will be limited, as big platforms can offset the increased costs "via an optimized supply chain," Liu Peng, general manager of Tmall Global, said in a statement Alibaba sent to the Global Times Wednesday. Rival firms JD.com Inc and Amazon.com Inc refused to comment on the reported new policies by press time. Liu noted that the changes could raise the entry threshold for cross-border e-commerce and facilitate tighter regulation of the fast-growing sector. China's cross-border e-commerce has been developing rapidly recently, along with increases in consumers' income. Cross-border consumer e-commerce in the country amounted to an estimated 259 billion yuan ($40 billion) in 2015, accounting for over 6 percent of China's overall consumer e-commerce, and it's growing by more than 50 percent every year, according to a report released by McKinsey & Co in February. Meanwhile, the increased demand for cross-border goods has not only benefited e-commerce marketplace operators such as Alibaba, JD and Amazon, but has also spurred the development of illegal gray-market imports, Lu said, which has greatly hit traditional offline retailing. "Consumers in China prefer to use daigou, as they can offer much lower prices," noted Lu. International luxury brands have taken some measures to tackle this problem, such as price adjustments and opening their own online sales channels, and this meant the market for goods bought via daigou decreased to approximately 43 billion yuan in 2015 from 75 billion yuan in 2014, according to a report issued by global market research firm Bain & Company in January. Liu Dingding, an analyst with Beijing-based consultancy Sootoo, said the new tax policies may add to the costs for daigou and help stem illegal imports. Generally speaking, the new policies aim to push forward the development of domestic cross-border e-commerce in a healthy way, Liu told the Global Times Wednesday. "According to new policies, as far as I know, an individual in China will be able to purchase goods worth up to 2,000 yuan from overseas, indicating the government's desire to encourage cross-border business," he noted. Purchases from overseas markets are limited to a maximum value per item of 1,000 yuan, according to the current rules. Both Lu and Liu believed the new policies will include differentiated tax rates for different categories of goods.